The nice thing about the world of Vectrex is every now and again you come across a new snippet of information, this could be a lost software prototype being found or a strange embodiment of the Vectrex not previously seen. Well, currently selling on ebay there is what is being called a Bandai Vectex demonstration machine. There are already known shop display units that were used for selling the Vectrex console in shops in America and Europe. These were the initial markets for the Vectrex. Then later, the Vectrex was also sold in Japan under the name Bandai. The Bandai Vectrex is a rare machine in itself. Needless to say, this is the first time I have ever seen a display cabinet for demonstration of the Vectrex aimed at the Japanese market. It looks pretty cool. The artwork and styling are not far removed from an arcade cabinet style. As one would expect this rare system is commanding a lot of interest. The last time I looked on ebay there were 17 bids and with the highest bid price approaching 2500GBP! Only a few hours to bid remaining. Over the last few months I’ve received a few enquiries about providing overlays which are just one colour and with no other artwork. Specifically, I have received requests from two Vectrex fans for a green colour overlay. Well, I stipulated these requirements to my local printers and I am happy to say I now have in my possession a brand new batch of professionally screen printed green overlays. These have been die cut to shape to fit in the front of the Vectex. More information availabe under the "Shop page". If you would like to purchase a green overlay please email sales@vectrex.co.uk stating quantity required and your country. Fury’s Warrior game became notorious for being produced late with a delivery time of some four years. However, in fairness, Fury managed to honour everyone’s order and now that all buyers have received their Warrior cartridges, Warrior can be downloaded for free. In addition Fury is selling surplus overlays for this game. Now Fury has cleared the Warrior backlog, it looks like he is back on track and busy on completing his other promised games. And the next one scheduled in his game series looks to be very interesting. This is a software and hardware combination. Called Hellhole, the game is designed to work with the Vectrosis spinner controller. Pre-ordered Vectrosis sets begin shipping this December although the Fury website does add the caveat that distribution will take several months. A snippet of the gameplay has been posted on YouTube and it looks very promising. vecZ is a new vertical shoot'em up game for the Vectrex created by the Swiss coding team know as la1n. In the game you fly a ship into a vertically scrolling cavern and must avoid the weapon fire of the enemies. You must shoot to destroy the enemies and gain points. The game play is not bad considering the whole game has been squeezed into just over 5.5KB! There are over ten different enemies to negotiate each with their own behaviour. Subject heading says it all! All stock finished for 2016. New overlay batches scheduled for 2017. November 1st is the usual day of recognition where players around the world turn on their Vectrex consoles, play to their hearts' content, and then make a record of what they played for the Vectrex wiki. Full rules, bonuses, etc. can be seen at vectrex.wikia.com. However, this is no usual Day this time around: as it was recently discovered, the Vectrex game cartridge collection hit over 100 individual cartridge releases sometime in the last year. As it only took over 30 years for this to happen, let's all make this an extra special one in honour of our favourite (and only) home vector console! The recent Geekfest 2016 Berlin event held on 17th-18th September featured many of the founding fathers of the early personal computer era and first hacker scene. There were a number of different panels and one included a live video chat with father of the Vectrex, Jay Smith, and hardware designer for Vectrex, Gerry Karr. Some new interesting history was given. E.g. The first game written for the Vectrex was actually an Asteroids clone but this game was never released (for obvious reasons) and later Mine Storm came about. I wanted to attend this event but couldn’t but I got a number of my questions asked at the Q&A. Missed the event? Thankfully the live stream was recorded and is now available to view on YouTube. If you are a Vectrex fan, this video is well worth a watch. Why no posts in September? I blame all the new homebrews that have been released :) It’s incredible how many games are coming out - As a result this year the Vectrex catalogue has reached more than 100 game carts in total! Not bad for a gaming console which only had 28 games officially released for it during its relatively short production run. At the beginning of this year I spoke before about a Vectrex renaissance; Well its really happening, with a whole lot of new homebrew games and hardware being released in the last few months. The image below shows the games I have recently been playing. I’ve been spending most of my time beta testing Thomas Sontowski's excellent Robot Arena. My poor game controller hasn't seen so much hard action since the spell when I was playing Protector non stop for a few weeks.The game itself is ready but he wants to investigate releasing it with an overlay and box, so it will be a few months yet before most people can get the physical release. But there are also new games you can get now. Vectrexagon is a really mesmerizing game which is accompanied by music that changes as you progress through the game. The sophistication of homebrew packaging has also raised a level with the quality of products on par with that produced from GCE/MB in the 80’s. The most recent examples being Binarystar software’s Nox and Death Chase, and Chris Parson’s Big Blue. All come with beautiful packaging and overlays and the attention to detail is fantasic. Luchs-soft has also been busy releasing Vectrex games too, the most recent being Dead of knight with a game plot that ties in with a YouTube movie. There’s a lot more promised to come too, Kristof Tuts will eventually be releasing his Vector Patrol, Binarystar software will be releasing their many lightgun (and lightpen) compatible games and there are sure to be others. Haven’t bought any of these games yet? Do so now - I have added the links to make it easier! I believe Binarystar and Vector Republic are already collecting names for the second run of their recent games. Nox and Death Chase (one cart two overlays) - Binarystar Software. Galaxy Wars and Space Launcher (one cart) - Binarystar Software. Dead of knight - Luchs-soft. Big Blue - Vector Republic. Monday 15th August - Berzerk Arena - The first ever Vectrex network! So what exactly is Berzerk Arena? This is a Vectrex game demo from Alex Herbert written in 2005. It is a one or two player game, but the big difference with any other Vectrex game is that in two player mode, it is played with two Vectrex consoles - yes a Vectrex network! A four signal cable (pins 1, 2, 3, and 8, connected to pins 1, 2, 3 and 8 respectively) is connected between the player 2 port of each Vectrex. Once connected and a serial communication established between each Vectrex, each player is able to play against each other in real time. Based on the theme of Berzerk, this is Berzerk in a 3D maze and with only the player robots pitched against each other. Evil Otto occasionally jumps around the corridors and if you are in the wrong place at the wrong time you are dead. You must search out the other play and shoot him. There are various objects that can assist you. You can find heat sinking missiles, and health replenishing objects. The video shows the displays for two connected Vectrex consoles. Obviously I am primarily controlling my player on the Vectrex on the left. I move to the other Vectrex later in the game just to demo the visuals seen by each player. At the beginning you see that once a link is established (by pressing button two on either Vectrex) you can choose the arena you want to play in, and the number of lives each player is to have. Alex, has mixed Vectors with raster, and in this program you can step through the different arenas which are displayed in 2D top-down perspective via raster style graphics (which is no mean feat on the Vectrex!). Once you have selected the arena and number of lives you can press button 1 to start and you will be placed into the arena and faced with a 3D perspective (think 3D MonsterMaze on the ZX81). You control your player movement through the many corridors of the arena using the joystick and buttons 2 and 4 to rotate your view and look left or right. Each player has an audible sonar. As you get closer to the other player, the audio pips of the sonar ring closer together and more frequently. If you jump to time stamp 1:30 of the video you see an object which if you run into behaves like a portal and automatically puts you somewhere else in the arena. At time stamp 1:55 you see an object which if run into gives you a heat sinking missile. At time stamp 2:45 you see Evil Otto jumping away into the distance. At time stamp 3:00 I am chasing Otto, and as he runs into the corridor where the player two is. You see from the right Vectrex the perspective of Otto for player two. At time stamp 3:03 Otto kills player two. The game jumps back to a random position in the arena, and by chance it is in the vicinity of the other player. From time stamp 3:10 to 3:40 I am just experimenting with the left Vectrex controller to see how I appear to player 2 on the right Vectrex. As you can see the communication between the two Vectrex consoles is really real time. In fact the communications are taking place at around 9600 baud rate. At time stamp 3:35 I am taking shots at the other player. Each shot reduces his health and eventually he loses a life. This really is a fascinating game demo which is polished enough that it can be considered a complete game. You can get the ROM binary for this game by downloading Malban's Vectrex Integrated Development Environment (VIDE) software. Malban has even provided some instructions on how to make the cable and he has diss-assembled some of the existing test binaries in case other programmers wanted to try writing new games using Veclink. Wednesday 10th August - Vectrexagon arrives! Ok, tools are down at Vectrex.co.uk! Now my Vectrex project delays are being caused by a new infuriatingly addictive Vectrex game... My copy of Vectrexagon has just arrived in the post. The video literally shows my first game play for the game straight out of the box. Here I have used a Vector Pilot overlay and dimmed the room lights to achieve pseudo colour. This game is great! It is simple in concept but really is challenging. You will always end up wanting to have one more try :) If you're an electronic music fan you'll love the background music which accompanies and changes as you play. I score this game 4/5. Any issues? Well despite this game originating from Sweden, the only place you can get it currently, is from is Packrat. That's not the issue, as Packrat have packged the game well and do quick delivery. The problem is the high price for delivery to Europe charged by UPS. In total I paid 50USD for the game and to get this game here to the UK. Nevetheless, I still recommend to buy this game. A new episode of Vectrex radio is now available to listen to. Hosted by Indieseoul and Willie!, these two guys review Polar Rescue and Pole Position. But even more interesting than that, they interview Chris from Binarystar software about the recently released Death Chase, some of his other Vectrex home brews including plans for future light gun game releases. It's nice to hear some background about Chris and how he got into programming for theVectrex. Episodes can be downloaded from vectrexradio.blogspot.co.uk or as free audio podcasts via itunes. Friday 5th August - I’m back! After a brief hiatus I am back to report on news in the Vectrex world! Only time restricts me on my own developments (Selling Mine Storm repro overlays was keeping me busy); However, keep visiting this page to be the first to catch my new developments - I will be updating more regularly again. Finally, the new batch of repro Mine Storm overlays is here and ready to ship! Please note these overlays are professionally screen printed and die cut. These should not be confused with the cheaper lower quality homemade ink jet produced overlays that can be found on the internet. You will find it very difficult to tell the difference from the original Mine Storm overlay. The only give away is the small copyright text on the right side of the reproduction overlay. This text says reproduction on purpose in order to distinguish it from the original. For the same postage amount I can post up to two overlays in the same package. If you would like to purchase a reproduction Mine Storm overlay please email sales@vectrex.co.uk stating quantity required and your country. Early Alpha release showing new Light gun game "Ghost Bursters" in operation. Exciting things are afoot in the world of the Vectrex and this is sure to lead to a new way of interacting with the Vectrex. Riding on the technical success of his Vectrex light pen game Whack-a-mole, Homebrewer Chris from BinaryStar Software has very recently shown three (1, 2, 3) YouTube videos on his experiments of using a SEGA Light Phaser with an adapter he made for use with some Light gun compatible homebrew games he is making. Surprisingly, the gun seems to work quite well, and you are not restricted to have to keep the gun close to the screen. My recommendation is to purchase a Sega Master System gun as soon as possible in preparation for the release of Chris’s new games. There is no announcement on any of the games availability but it will be reported here as soon as it is known. Currently the games are in the alpha and beta release stages and are only available to Chris’s testers. Regular visitors of Vectrex.co.uk may have recently noticed that access has been a bit temperamental. The reason for this is that in the background I have had to change to a proper web hosting provider (previously the Vectrex domain name just jumped to a free hosting service provided by my broadband provider). It took a couple of days to allow propagation for the new host details and for the changes to be updated across the internet. Hopefully, everything is sorted now. I've just added a link to "The Definitive Guide to Vectrex Collecting" on my general links page. That website has been online for more than a year now but it is only, whilst tidying up the links on my website, that I'm now catching up. Vectrex Fan going by the tag of 50TBRD has created the website and he has done an excellent job. It's a website which includes all Homebrew released games and hardware. 50TBRD has liased with a number of collectors to acquire a lot of unique information. There are comparisons of all versions and variations of each release as well as pictures and information that is not available anywhere else on the internet. Also included is a filterable and searchable checklist which can be used as a rarity list or resource for determining value of various Vectrex products. Definitely recommended! Go visit the site. In the Vectrex Fans Unite Facebook forum, Vectrex fan Chris Romero mentioned about a possibility for a door bell that chimed with Vectrex sounds. Well, I thought about that, had an old ISD1420 ChipCorder circuit lying around from a previous robot project and had a go at making the world's first Vectrex chiming door bell :) As a first go, it does exactly what a door bell should do. To be more effective an amplifier circuit would need to be added, as the current circuit does not really have enough power to drive a speaker direct. I’ve been beta testing a Vectrex game called Robot Arena from new Vectrex Home brewer Thomas Sontowski. And oh boy, what an intense and challenging game it is. You are placed in an arena, and for each level, you are pitted against various groups and combinations of robot enemies each with different behaviours/movements. Depending on the robot type, which is either passive or can shoot at you, you can collide with or shoot at, to eliminate them. It’s a very fast shooter type game and like Robotron uses a dual-joystick setup (you need two analogue Vectrex controllers). Fortunately, if you only have a single Vectrex controller the game is still very playable. Although Robot Arena is a completely different game compared to Alex Herbert’s Defender clone known as Protector, the slick graphics and sound of the game make me feel that the engine underneath, is from the same family as that used for Protector. The fact that I am comparing to Protector is a huge compliment to Thomas. Thomas has also used his own text display routines, and the font shown is very arcade like. He has pushed the Vectrex to the limits, and as such, not all Vectrex consoles can display the text correctly by default. Fortunately this is easily solved by changing a setting at the beginning of the game and via an options screen. The game play graphics are in vectors, and they are fast and intense. 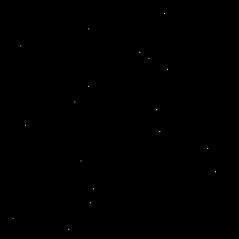 As the game levels progress, there is a huge amount of independently moving vector "sprites" on the screen;- I’ve never seen so much screen activity in any other released Vectrex game and yet Thomas has optimised the display of the graphics and their appearance is flicker free. By the time you get to level 4, you are in the thick of it, and your poor Vectrex controller will receive much punishment :) Luckily, although each level is intense, game play in each level is set to a maximum time limit after which you know you can have a small rest before proceeding to the next level. Thomas plans to make a cartridge release around April this year. The cartridge will include a built in EEPROM for high score saving and game options. This is a fantastic first game from a new Vectrex home brewer. I eagerly look forward to the physical release. Are all your senses getting enough Vectrex? Well, since October last year there has been a monthly downloadable radio show all about the Vectrex. Hosted by Indieseoul and Willie!, these two guys have fun presenting each episode. The shows typically last more than an hour and a half and cover a variety of Vectrex topics including original released games, homebrews and prototypes. I’ve been busy this month with beta testing kristof’s Vector Patrol . This, like Kristof’s other games is definitely going to be one to have in your Vectrex collection! It’s a 64KB ROM game and as such is full of little game goodies which extend the play and interest in the game further if you get bored with completing the main mission. One amusing game option is the choice of player type. Amongst the different space vehicles to select is a cowboy on a horse! You can also select different backgrounds including one called West World where the backdrop features cactuses and buildings from the American frontier (see half way through in video). Kristof kindly granted me permission to share a short video showing this mode in Vector Patrol. But he did say to mention that it isn't finalised yet and could differ in the final game. Please note as always with the Vectrex, a video of the machine in action is never able to do it any justice. To really appreciate you need to experience the game on the Vectrex itself and in a dimly lit room. The game is not due for release yet as it's still being beta tested by a number of testers and Kristof still has some final programming to do. However a release by mid 2016 seems realisitc. Tuesday 5th January - Happy New Year! It was back in January 2008 when I setup this simple website to capture all things Vectrex. Now we are in 2016, and the website will be in its ninth year - (crikey, that also means I’m nearly nine years older - where did all the time go?). If any of the previous years are to go by, there will be plenty of developments for the Vectrex to report on in 2016. For the last couple of years I have been saying that there is a Vectrex renaissance and I still believe this is so. Vectrex homebrewers seem to come and go in waves. They can be very prolific but then all of a sudden they go quiet for a number of years. The Vectrex scene is currently fortunate to have input from both homebrewers who are relatively new to the Vectrex scene and some long timers, so seeing new games on the Vectrex this year is a dead cert. Last year we saw a whole lot of homebrew developments some already released, some due for release this year. There also appears more interest for owning Vectrex products too (and its possible to conclude there are new enthusiasts coming to the Vectrex world). A side effect of the renaissance, is the Vectrex has a new increased desireabily. Using ebay as a price barometer, you can see the final auction prices steadily increasing, especially over the last couple of years. I have been doing some early spring cleaning of the website. As part of this, in the last two days I’ve been updating the high scores page. My apologies to those who have submitted scores nearly a year ago. Basically, I was swamped by the number of submissions, and in addition the balance of Vectrex life was taking second position to real life. However, I can declare that the high scores is now up to date. If I’ve missed any submissions, please email again and I will correct the issue. 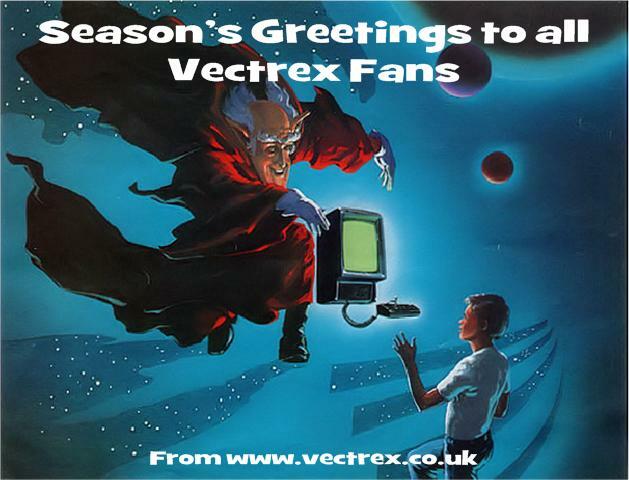 Finally, I would just like to say thank you to all those Vectrex fans who have contacted me with comments about the website, scores and Vectrex news. My passion for anything Vectrex makes me want to share information about this wonderful machine to all that listen. Having dialogue and feedback with like minded Vectrex fans makes the hobby even more of a pleasure.